The afternoon Shark-Free Challenge was exciting as usual. There is always one dark horse who the players must be wary of. 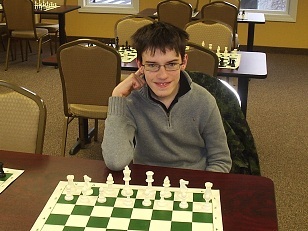 This week that player was Robbert van Batenburg who decided to play in his first rated tournament! Robbert is no newcomer to the game and was hoping to score well. Alas, regulars Rory Dougall and Ellen Rosenfeld had other ideas and both managed to defeat Robbert despite some tough struggles. This week fate sided with experience. Rosenfeld put in an impressive showing to win the tournament with a perfect score, defeating Dougall along the way!